July 1939 and British-born John Russell returns from a trip to the United States with his son to re-enter ‘The Cage’ of Nazi Germany. As a foreign correspondent, Russell is aware that war is coming and the trip has provided him with an American passport that will enable him to stay living near to his son and close to his lover, the movie actress Effi Koenen, and a new job working for the San Francisco Tribune. The passport came for the price of spying on behalf of the United States, the job on condition that he exposes the plight of Jews in German controlled Europe. He arrives back in Berlin to find Effi in a basement cell of the Gestapo headquarters. The price for her release is Russell working for the Nazis, offering his services to the Russians, to whom he’ll pass on disinformation. Russell has communist leanings and on contacting the Russians offers to be a double agent. As tension rises along the Polish border, Russell plays a dangerous game of trying to keep his three controllers, plus his employer, content without revealing his duplicity, travelling to Prague, Breslau, Warsaw, Bratislava, and Moscow, notionally to cover unfolding events. To make life even more difficult, he has agreed to help a friend track down the Jewish niece of one of his employees that disappeared on arrival in Berlin, and Effi wants to find ways to resist and undermine the Nazi regime. 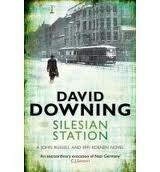 There’s a lot to like about Silesian Station and it’s a step up from the first book in the series, Zoo Station. The characterization is richer and more keenly observed, and the plotting is excellent, interweaving a number of strands that collectively keep the dramatic tension high throughout the story. The historical context is well realised, both in relation to the larger macro-politics across the continent in the lead up to the start of hostilities, but also the everyday realities with respect to the diverse circumstances and views of people within communities, and how politics and communal relations played out in different locales (Berlin, the Polish border, Moscow, Prague and so on). Whilst the prose is quite workman-like, Downing nevertheless captures the sights and sounds, the cinema and cafes, the streets and apartment living, the fashions and pastimes, and the hopes and fears of people in difficult situations. 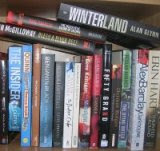 The result is a rich, rewarding and entertaining read that steadily builds in tension and is satisfyingly resolved.